Downtown Erwin is the perfect place to enjoy an August afternoon. Set like a jewel amid the Appalachian mountains, the city bustles with its own energy. 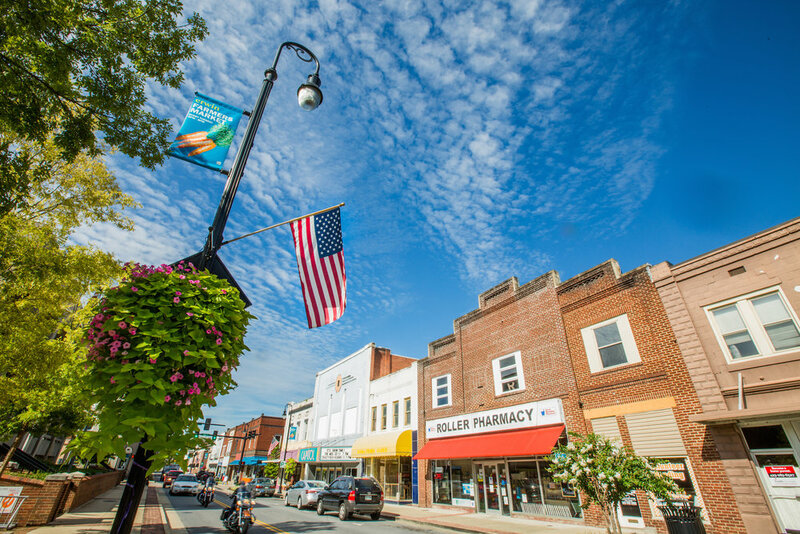 Small businesses such as pharmacies, a first-run theatre, a florist, a furniture store and a hardware still occupy the Main Street. These businesses form the nucleus of Unicoi County’s small business economy and anchor the city’s and county’s identity. Five churches are within three blocks of the courthouse. Nearby, construction is taking shape on a new industrial site and a new supermarket – all within walking distance to downtown. Infill development continues to roll in and the city has put a high priority on retaining existing businesses. Angels, shepherds, and wise men of all ages participate in the annual Erwin Candlelight Nativity Parade, produced by several local churches and RISE Erwin. The parade takes place in near-darkness with streetlamps shut off and nearly 400 parade participants carrying candles they bring from home. The parade leads to a small, informal outdoor worship service attended by over 1,500. Erwin’s Nativity Parade has attracted attention from the regional press and has brought participants from several cities nearby. Participation has grown each year and offers an inclusive opportunity for a community Christmas gathering. Local small business owner Matt Moses demonstrates stand-up paddleboarding on the scenic Nolichucky River. Matt, an experienced river guide with a staff of guides and experts, leads trips on paddleboards, kayaks, canoes, and rafts. Adventure tourism plays an important role in the local economy. It is estimated by the Tennessee Department of Tourist Development that nearly 100 jobs are created in Unicoi County each year through adventure tourism. This diversification from the traditional coal and manufacturing economy will continue to lead Erwin, Unicoi, and Upper East Tennessee toward an economically sound future. At What's the Scoop Ice Cream and Board Game Cafe, two women enjoy ice cream cones and a game of Risk. What's the Scoop is one of two downtown businesses assisted in 2018 by a grant from the Appalachian Regional Commission. This fun, inviting space looks out onto Main Street and is a favorite among children and adults alike. Its owners bring in thoughtful touches unique to the market, such as house-made waffle cones and dairy-alternative desserts such as pepita milk and coconut milk-based treats. It all comes together to make a memorable destination in downtown Erwin. The survivor's lap at the American Cancer Society's Relay for Life is a treasured event in our community. Relay for Life raises funds for cancer research and advocacy in Erwin and Unicoi County and helps those undergoing treatment. In 2018 alone, the Relay team raised over $50,000 for the American Cancer Society through various community programs and projects, culminating in a celebration of gladness and everyday victories over cancer. Street markets take place relatively often in Safety Harbor. They provide ample opportunities for an aspiring entrepreneur to field-test an idea for a restaurant or retail shop in a low-risk way, or for existing businesses to connect to folks from the community. If freshness of produce is important to you, this is also where you can go to join one of the nearby urban farms that can provide you with a weekly supply of freshly harvested fruits and veggies. Often, markets can build on traffic from other events such as the monthly 3rd Friday street festival, runs/races, and annual traditions that bring in visitors who patronize shops and restaurants around town. These often center on the town Gazeebo, the local central gathering spot just blocks from city hall and in the heart of the downtown. Downtown Safety Harbor supports a wide array of housing and styles, ranging from affordable accessory or mixed use apartments, to trailers, larger single family homes, townhomes, and assisted living. Accessory dwelling units are generally permitted by zoning, even in neighborhoods of single family homes and especially near downtown. Much of the new development takes an urban form, such as these townhomes, and some have commercial space on the first floor and offices or apartments above. In this way, investment can continue to deal with and adapt to the inevitable change that comes to the built environment with age and still keep Main Street active. The Safety Harbor connector is a bus service linking Safety Harbor to the nearby metropolitan area and making it possible to get by without a car if needed. Also visible in this photo are the brick pavers at the intersections along Main Street. The bricks help keep traffic at appropriate speeds and make it easier to cross the street. The commercial district has also expanded to the blocks off Main Street with many small businesses that provide the backbone of the town’s economy. Low-cost signage has helped to connect these areas with Main Street activity, and are an example of a low risk investment that has paid dividends for the city. One can also see street trees along Main St that provide shade and further calm the traffic. The big, pink elephant is #FlowerPowerEllie; she stands in front of the Safety Harbor Art and Music Center (SHAMC). The center is a privately developed and funded local nonprofit, located in a repurposed house and dedicated to promoting the arts in the community. Their upcoming music festival permeates the town with gigs in various parks, theatres, restaurants and breweries with the tagline #smallervenuesBIGtalent. Also pictured here are several other former single-family homes that have been repurposed into restaurants and other commercial space. Flexible uses and street parking have helped the district to thrive, including several restaurants that operate successfully with little or no on-site parking. The recent Bloom’N’Chalk festival is typical of events in Safety Harbor. The festival is an annual event that turns the sidewalk squares along Main Street into temporary canvases and attracts both local artists and those from around the country. The frequent programming along Main Street is largely self-supporting, and often raises funds for charitable causes. Sidewalk connectivity, bikeability, and walkability are important to the town and it shows. With miles of waterfront trails, pedestrian bridges across the gaps between dead-end streets, and safe streets relative to the rest of the region, the town is great for fitness runs or walking and biking to school. This section of Main Street also happens to be blocks from the centrally-located elementary and middle schools. Several parks, playgrounds, classes, and other after-school activities are also within walking distance.